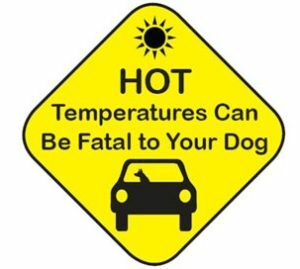 We love our furry friends and want to take them with us everywhere but leaving them in the car for “just a few minutes” can be dangerous with temperatures on the rise. Vehicles are tin cans that absorb and retain heat at astronomical rates. The temperature inside a vehicle can rise approximately 20O F in just 10 minutes! You could have the intention of just running into the store but reality is it is just too risky. Pets can die from heat stroke, and heat exhaustion. 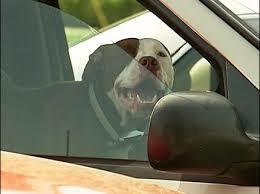 They can also become massively dehydrated and sick from leaving them in a vehicle for extended periods of time. To show you how fast temperatures rise in vehicles I have found a chart from a recent study released from San Francisco State University. The temperature increases are staggering! 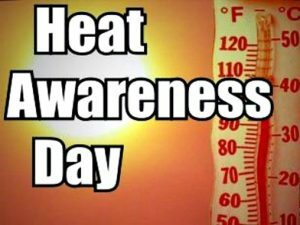 National Heat Awareness Day is not just about pets locked in vehicles but also about how hot the temperatures are in general. Animals need to stay hydrated and shade to prevent them from going into heat stroke or heat exhaustion. 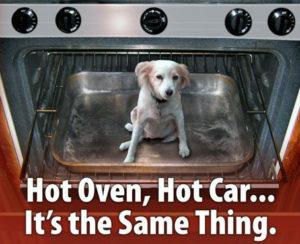 Pet owners should also be aware of how hot pavement gets. The pads on dogs’ feet can be easily burned by these surfaces. A general rule of thumb is if your can’t keep your hand on the ground for 60 seconds it is too hot for a dog too cross so don’t force them to!